A CAT scan, or Computed Axial Tomography or CT scan, is an imaging study which uses x-rays to produce images of the internal parts of the body. It is commonly used to visualize the brain and other structures in the head to investigate diseases of the brain. They can be used to visualize other body parts as well, including the chest, abdomen and pelvis. A CT scanner, like a brain MRI scanner, is a large donut-shaped device that the patient is place into on a moving table. Rather than a plain x-ray machine which shoots a single burst of x-rays through a body part, a CAT scan rotates around the patient while using x-rays to take several radial images. Through computer manipulation, these multiple images are recombined into cross-sectional images of the inside of the body which gives much more subtle and detailed information than a plain x-ray alone. These images can then be viewed by a radiologist or other physician to interpret. X-rays are high energy photons (the energy "packets" of electromagnetic energy, similar to light but not in a visible wavelength) similar to gamma rays that pass through the body. More dense tissues such as bone block most x-rays while softer tissues let more x-rays pass completely through. Therefore, the image produced by an x-ray and CT scan is based on the density of tissues. Bones show up brightest while air is the darkest. Because a CAT scan brain scan uses x-rays, the patient is exposed to some radiation. However, because most patients are not exposed to many over a lifetime and because the exposure is small, they are generally considered very safe for general use. They do not cause any pain or discomfort but some patients complain of claustrophobia while in the round scanner. 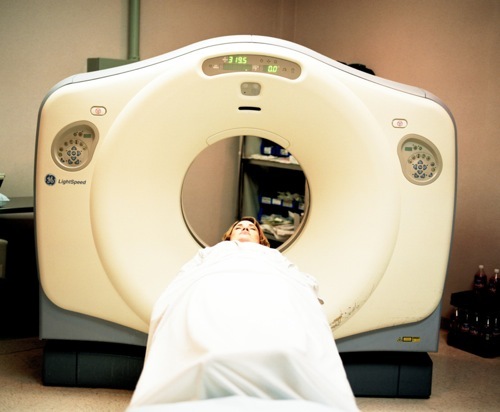 However, most CT scans are very fast, faster than a typical MRI scan. Occasionally a brain CT scan is performed with an injection of a contrast agent. Contrast is basically a dye that is injected into a vein which is very dense and therefore shows up brightly on the CT scan. It can help to visualize blood vessels and may make some diagnoses, such as some brain tumors, easier to see. CT brain scans produced a quick and relatively inexpensive, compared to MRI, image of the brain and surrounding structures. It does not have the high resolution and special imaging types that MRI is capable of but it has advantages over MRI in a couple areas. For one, CT is very good at showing detail of bone anatomy and pathology. Therefore, for identifying fractures and bony spine abnormalities it is superior to MRI. CT is also very good at demonstrating acute bleeding. It can clearly show bleeding associated with trauma, rupture of an intracranial aneurysm or other causes. Therefore, CT is often used in the setting of trauma and some other hemorrhagic conditions. For other pathologies, like ischemic stroke and brain tumors for example, generally MRI is preferred for its better anatomic detail and resolution. However, in some centers MRI is not as easily available or CT will be performed first because it is cheaper and faster as a basic screening test. While MRI is generally better for most types of spinal disease, CT can be helpful in demonstrating bony abnormalities in spine disease. from the CAT Scan page.